Ted Tine Performance Products is the first in the industry to manufacture a fuel valve with an innovative "click." 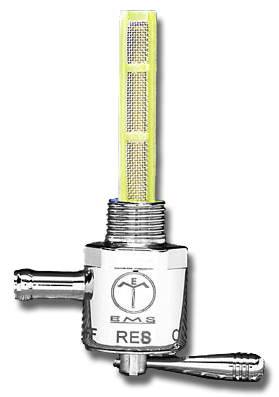 Our patented fuel valve is specifically designed to indicate positively where 'on,' 'reserve' and 'off' are. Finally you never have to worry about where reserve is! While other in the industry constantly change and increase their flow using the original design of their valve, ours always has been 88 ounces per minute. The confidence we have in our product design allows us to continue to provide a lifetime warranty that you can't find anywhere else. Filter Rate	1156net @ .15 sq.in. All external parts are forged brass, with triple plate show chrome. Uses nylon filter to retain shape better and is replaceable. Internal components are teflon to eliminate the need for rebuilding. All units are 100% electronically factory tested. Lifetime Warranty. Pre 1975 Tanks internally threaded for 3/8 NPT & Custom Applications.